The atmospheric sounds of cymbals being gently played with violin bows whispers the start to “The Human Detained”. In the dusky-lit stage surrounds the sound texture is comforting. Soon, however, it begins to grow in contrast as flute, violin and oboe are added to the mix of tentative sounds, ultimately increasing to an almost disturbingly-harsh screech that typifies the musical aspect of the show that comes courtesy of the eclectic Kupka’s Piano. But this is a collaboration between the musical collective and Makeshift Dance Collective and as worlds meet in creation of new understanding, a shaped and layered performance emerges in presentation of its poetic ideas and exploration of themes of alienation and restricted freedom. Indeed, the show contains a range of ideas in what is essentially four world premieres of substantial new works by young Brisbane composers Steve Newcomb, Michael Mathieson-Sandars, Samantha Wolf and Brodie McAllister, each with its own distinctive style and flavour. Contemporary dance means lots of lyrical floor work, with dancers all presenting with equal parts sharpness and fluidity. Synchronicity is almost there but sometimes feels like it still needs some polish. However, Gabriel Comerford is particularly engaging in flexibility and fearlessness as he flies about the stage in performance. As with any anthological work, there is sure to be varied standouts to audience experiences. Mine was Samantha Wolf’s “The Binds That Tie Us”, aka ‘the one with the eggs’, which is as enigmatic in realisation as presented in that description. 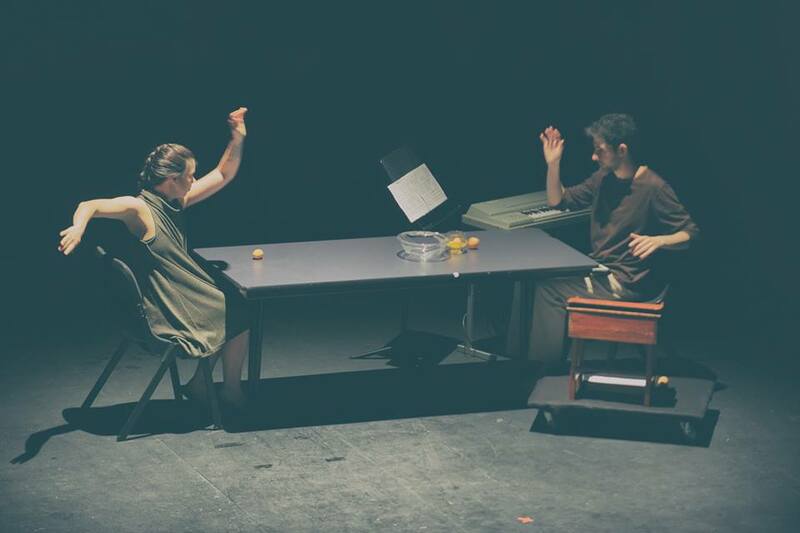 It beings with eggs being rolled across a table between two performers, interwoven with bursts of music from a tiny piano and other quirky instruments, before the empty egg shells are spread in line across the floor to be systematically danced down upon. Beyond this, “The Human Detained” is as difficult to describe as it is to categorise. As with any work whose essence is drawn from conveyance of concepts within a narrative framework, it is bound to elicit eclectically curious audience responses ranging from banality to profoundness. But this is exactly the appeal of the arts. And nowhere is anything more subjective than in the worlds of music and dance, especially when combined in creative collaboration. This entry was posted in Brisbane and tagged Gabriel Comerford, Judith Wright Centre, Kupka's Piano, Makeshift Dance Collective, The Human Detained by bluecurtainsbris. Bookmark the permalink.